Busy day today! Have a few posts to make but first I am going to start with Bath and Body works since it was my first stop of the morning. I LOVE Bath and Body Works – even love isn’t a strong enough word for how much I enjoy their products. Pretty much all the employees recognize me when I walk in the door. I had to go for the free gift – I picked up some Christmas gifts while I was there so it was okay. ;) Christmas gifts and a free gift for me? Something like that. This offer was today only from 10am-3pm – you got the free gift with any home fragrance purchase. 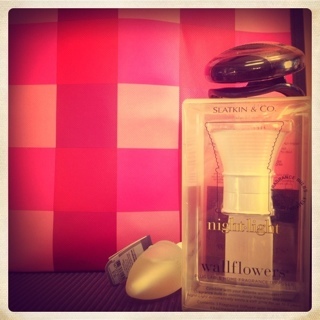 Bath and Body Works tote tote, Wallflower Nightlight Starter, Single Bulb and Scentportable! After Bath and Body Works we went to Costco, just for the regular food and stuff but scored a free roll of toilet paper sample – pretty awesome right? Who doesn’t love free toilet paper? This entry was posted in bath and body works, deals, free gift and tagged bath and body works, free gift on November 19, 2011 by Courtnie.